Imagine the hidden beauty found only in the fleeting moments at the end of a perfect summer’s day. Greg Budig uses his familiar lyrical style of writing and rich colorful illustrations to capture this magic in his third book from Stemmer House Publishers entitled “At the End of the Day”. In this timeless story, you will follow a journey through time where robins sing, cats begin to prowl, and the children all shine in the last rays of the sun. This story is guaranteed to make you smile…at the end of the day. Daniel’s birthday is almost over when his grandfather hands him a surprise gift—a shimmering harmonica! Come join Daniel in the concert of his life. 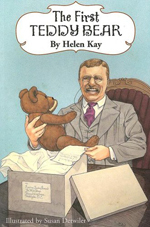 The well-loved story about how President Teddy Roosevelt spared the life of a little forest bear and how Morris Michtom celebrated the event by producing the first stuffed teddy bear. 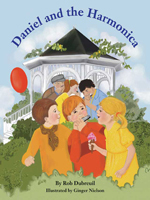 A hypnotic story about what happens when a child’s imagination greets the wind as it whistles past the house at night. Budig’s musical prose and provacative illustrations invite the reader to see the invisible wind by listening to the sounds the wind makes. 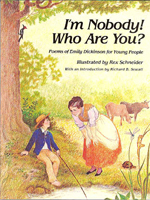 With full-color illustrations on every page, all faithful to nineteenth-century New England, the book gives loving attention to Dickinson’s best-loved poems for children.